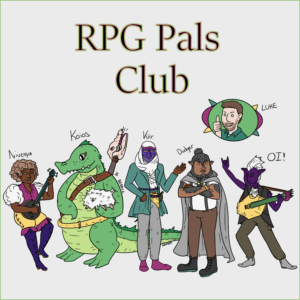 RPG Pals Club is a podcast about a club of pals playing RPGs together. In this case our first season is using the 5th Edition Dungeons and Dragons campaign Waterdeep: Dragon Heist. Our current plan is to release on a monthly schedule on the 15th of each month, with goals to get additional episodes out early. You can follow the main show Twitter feed which is @rpgpalsclub where you can find additional updates, art, and more!